This lithograph is taken from plate 17 of 'Afghaunistan' by Lieutenant James Rattray. He wrote: "Never were a wilder, more devil-may-care set of fellows seen than the Afghan cavalry". 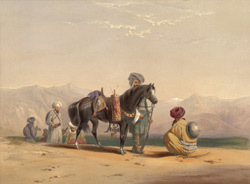 Known as Jaanbaz (meaning 'life gamblers'), the cavalry in the Shah's service often became mercenaries in the British army. Heavily armed, and very often professional robbers, they became soldiers when it suited them, said Rattray: "They take our service because we paid them well and regularly, but a great deal of the savoir faire was required in the management of them." He described them as "naturally a restless and independent people, and according to one of their own proverbs, ready to bear hunger, thirst, cruelty and death, but never - a master, they, by the same fate, could not endure the discipline of our regulars." The horse in the image has a box containing a Qalyan (pipe) and smoking equipment hanging from its saddle pommel, with a pan of hot coals to light it slung under the horse's belly.